Mii Snowdon is left on her own after her father disappears while investigating the mysterious letter-shaped pokemon called the Unown. The only clue to her father's disappearance is a box containing several tiles. While playing with these tiles, Mii makes a wish to see her father again, and this wish awakens the Unown—who summon the lion-like, legendary pokemon Entei to act as her father. Meanwhile, Satoshi heads to Greenfield with his faithful pokemon companion, Pikachu, to meet with his friends, Kasumi and Takeshi. When they reach the area, they are shocked to find the place crystallized. They quickly learn that the Unown are responsible for this, and that they will need to be defeated in order to restore Greenfield to its former beauty. The situation becomes personal when Satoshi's mother is kidnapped by Entei. To discover why his mother was taken away, Satoshi, along with his friends and pokemon, must travel the crystallized landscape to confront Entei and the Unown. I watched this as a child around 5-8 years old- and i remember it clearly- i have it on VHS and let me tell you-it was the bomb! it rocked my 6 year old mind. This was my favorite of all the Pokemon movies out at the time. It Had Great sound,great artwork, a heartwarming story and as a kid it was just awesome. They did a lot of character Development on Entei, showing his depth and he wasn't just the bad guy-he was the misunderstood villain,so much that i didn't see him as the true villian-he was the good guy to me.Entei was My Favorite character in the movie because the gave him so much depth,care and feeling to him. Another Pokemon movie. Pokemon 3. Even it has been a long time since I watched this one I still remember it. Story: 7 . Many have given this movie a low rating. I am not sure why because I think has a very good story. There is some mystery and it is excting story too. Art: 8 I think the art and sound is very good in this movie. What I can say about the art is that is a very beautiful art this time. Wonderful. Sound - as the other Pokemon movies. The characters is this movie in Ash and co. but there is also a little girl which is a very good character. And Entei, the 'father' who wants to give his 'daughter' everything. Enjoyment: I have seen movies many time and I think this was the Pokemon movie I enjoyed most. I thought it was an excting and touching movie too. "Spell of the Unknown" stands as the odd one out among the dozen or so Pokemon films. While the first was driven by plot, second by action, the third film is driven by characters. Molly, an aquaintance of Ash has lost her father on one of his excavations trips related to Unown, a mysterious pokemon species. Finding herself all alone, she is given unfathomable power by the same Unown who pushed her father into oblivion. As the traumatized child reshapes the world in her image, Ash's mother is kidnapped by Entei, Molly's projection of a missing father. Thus Ash is forced to venture into the heart of her twisted fantasy and make everything right. Why am I talking about the setup of a Pokemon movie? Because in this film, an intriguing premise is used to create a different experience. The most visible stand out in the film are the twisted worlds Molly created (and manipulates throughout the film). These locations keep the slow moving plot from getting stale. Spell of the Unknown keeps the plot really simple; the goal is to reach the heart of the twisted kingdom Molly is shaping and snap her out of madness. Throughout the film, she'll appear before Ash, Brock and Misty, testing their strength, as they and Delia slowly make the girl realize what she's doing is wrong. In the movie we're given a very memorable fight between Charizard and Entei, a fight that ranks among the best in the film series. Knowing that settling cerebral problems with a neat fight isn't viable in any self respecting work, this film uses it merely as a catalyst for the character resolution, instead of a resolution itself. The film isn't without its faults, though. One of the two major complaints I have is the mediocre soundtrack. While a valid critique, my the second complaint can't be helped - the middle of the film felt slow due to underwhelming battles. These moments really show how the budget for this film got cut. Beyond this, I've got minor nitpicks about about the dialogue at times (it helps a bit if you watch the film in Japanese with subtitles). 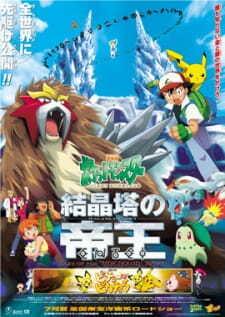 Pokémon 3: The Movie (or Emperor of The Crystal Tower: Entei if you prefer Japanese) is an interesting creation. It's a very subdued Pokemon film. At its core it's a fine children's character film (woe unto humanity if someone thinks I'm critiquing this with same expectations I have for Paradise Lost!). While it drags on for a few scenes, it's elevated by great visual design, locations and atmosphere. Character arc is resolved in a satisfying and not overtly cheesy way. Eventually there's a great Charizard VS Entei fight, too. What more could you want? Standing out as a slower character work, I'd recommend this one to everyone interested in Pokemon films. I can clearly remember, when someone older than me, and actual native english speaker - not like me - once described this movie, as a 'Silent Hill for children'. Linkara, was that you? Anyway, I can fully agree with him, because despite being about pokemon, this movie is dark. And sweet... like a salty liquorice! What I especially love about this movie, is that the setting for the story itself is actually in this time made... well, smaller, and thus more personal, than the first two movies. The first two movies - while still quite good - where all about saving the world, with rather bizzare messages and morals like, "the war is wrong, even though our entire franchise kinda sorta supports it", and "the power of one may sometimes be all that's needed... even if that one is kinda sorta pokegod" and so on, but this movie took it to the whole new direction. What if the stakes, and motives, where actually personal, rather than universal? Like say, a little girl is in mourning over her lost family, literaly whishing herself a new one, and thus endangering all around her, consuming anything and everything that stands between her and her illusions? Now that's... rather good idea, I'd say! It's all and good, if the heroe saves he world, or something, that is important to everybody, but what if he has to save something, that only he actually cares, and only he can loose - his mother! This plotpoint alone would have made this movie an awesome on it's own, but this is not actually the main focus, no! It's about a little girl, and her passion to life forever in this magical personal dreamland, where everyhting is beautiful and peaceful, everything she wishes or desires will happen and become true, and no one can never just come, then go, and leave you forever. While the first pokemon movie was all about accepting one's birth as it is, and the second was... well, saving the world, this movie is about acepting the emotional pain of isolation and loneliness, loss of the loved ones, and how to let go of something that you love and treasure the most... which is for Molly, her family. That's a real pickle, even for some of us adults to handle, but for a little girl...damn! The music, and the art in this movie, are both just breathtakingly beautiful, and precise. The music fits perfectly for every scene, and in every picture, packing every frame with absolute emotion, that I can only adore. When you want to cry, you cry. When you want to feel the adrenaline, you will feel it! "If that is what you wish" is still one of my favourite pieces of musical soundtracks, even on this very day! The action - a.k.a the actual battles - are also finaly done right, right from the opening credits! The battles themselves aren't overly done, or even on the majority of the runningtime, but substaine both entertainment, and focus to the plot, without feeling forced. The main characters are the very same nuckleheads that we pokemaniacs know and love - gotta love that ol' Brock - and even the ever so obnoxious Team Rocket gets a fairly decent amount screentime and some laughs in, and even some of their most heroic moments are captured in. Nice! The story itself... well, it's good and all, but it can be mayde little bit too cheesy or horned in sometimes - remember, we have to sell this movie outside of Japan, so we can't be too subtle, now can we - and the lessons a bit corny as well for my taste, but hey... it's a 90's anime series for ya, so what did you expect, really? Also, if you didn't like the desings of the little critters, after the first genertion, then you may not like all these new little monsters you see here either - Aipom is actually kinda creepy! As a child, I didn't really love this movie, because of the story - I just liked the Entei, music, and the awesome battles... just like any stupid child would. Also, I never really liked that Casey-dude, so I was more than thrilled, that they left him to rot somewhere, after the second movie! Now, as an adult, I can see the themes, the personal stakes, threat of the situatuon, and the contradictions of the morals of grief, loss and sadness, and now, I love this movie even more! This is everyhting, that pokemon is to me, when done right, and I would recommend this to anyone, who at least knows, what the pokemon is! If you still like pokemon, you are not too old to enjoy this movie, and you should... if for nothing else, but for nostalgia. Look at the top ten most successful anime at the American box office and its... almost all Pokemon, other toy/card game show adaptations, and Studio Ghibli films. But what other anime films have managed to make money in their limited releases?